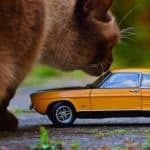 If you are confused about how to transport a cat by car long distance then this article will help you out. Here I have shared everything that you would need to know about long-distance travel with cats. If you are traveling a long distance, can you think of going without your beloved cat or can you keep it alone at home while you are enjoying a vacation? No, right? You just can’t leave your pet behind. Apart from that if you are moving from one place to another, it is obvious to take your pet with you. 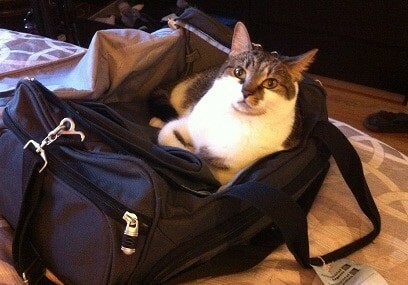 But it is really tough to travel with your cat by long distance, especially by air. Cats are really low-maintenance but their homes mean a lot to them and if you are shifting them from one place to another it can create a real problem. 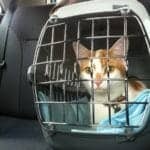 Transporting a cat especially by long distance is such a challenge for its owner. Traveling from one place to another may cause stress among cats. Even sometimes it can be harmful to their health when the traveling hampers their daily routine and it leaves a bad impact on their normal life. But if you are well prepared from before it can be less stressful for both of you as well as your cat. So, here are some helpful suggestions for you if you are planning to travel with your loving cat by long distance. In most cases, cats are not really comfortable for a car journey. To reduce the stress level of the cat, you have to keep the cat inside the carrier for some periods of time before starting driving. To secure the carrier, it should be kept in the backseat or it should be secured with the seatbelt. During driving, you must not keep the carrier inside a closed trunk. You may have special harnesses or seatbelt to secure the cat’s carrier. If you are willing to take the carrier by keeping in the front seat, airbag on that side should be turned off otherwise if an accident occurs, it will deploy and cause serious injury to your cat. This may sound weird but it is often seen that pets are hanging out car windows while driving. It is really dangerous. You must put your cat inside a safe carrier whole the time. Otherwise, your cat can easily run away or get injured by jumping outside the window. In maximum cases, cats are trained for peeing or pooping. But when you are outside your home, it is not the same as before. You should take breaks while traveling. You can bring a litter box with you and make your cat to pee or poop on it. 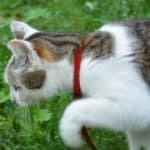 By any chance, you are taking the cat outside the car, make sure it is wearing a collar with an ID tag and the harness or collar should be attached to a leash which will make sure that it can’t run away or jump out of arms. You should never keep your cat alone in the car and leave. Especially when it is hot and sunny. If the cat is left inside the hot car, it can suffer from organ damage or die due to the heat in the worst case. A car’s temperature can increase up to 116 F just in an hour when the outside temperature is just 72 F. During hot days, it will only take half an hour to reach your car’s temperature over 120 F.
The carrier must be enough spacious so that your pet can move comfortably and lie down. You should also buy a carrier which is easy to carry with shoulder straps and handles. They also need to be strong enough to bear the weight of the cat. In the market, you can get a variety of carriers like soft-sided, hard-sided etc. You should buy a carrier which will at least last for a year. You must not want to change the carrier in every 3/4 months. If you are travel by air most often, you should buy a carrier which is airline approved. Before the journey, you have to make sure that your cat gets used to with the cat carrier if it is not already used to. For this reason, keep your carrier in the place where your cat can access easily. Then make sure your cat is not afraid of it at all. You should give some time to the cat so that the carrier can be a regular part of its daily life. After that, try to keep your cat inside it and take your cat in short trip inside and outside your house so that it can normally get used to the carrier and finally it can become ready for the long trip. Before traveling, you have to determine for how long the trip is going to take and make the plan according to that stop points. If you are traveling for a really long time like 8 hours or more, you should take some necessary preparations for food or lash. You can also find some hotels which welcome cats. One of these hotels can be you stop points. Wherever you are going, try to make a place for the cat which will be equally comfortable as like before. Because the new place will be really uncomfortable for her. Even being careful, an accident can occur. So, at first, make a collar with name and contact information if your cat runs away or get lost. You can use also microchip. Instead of giving a home number, you may give your cell number for identification which will be more helpful for you to find out the cat. The carrier should be prepared in such a way that it feels really comfortable. At first, you have to put bedding in it. Then put 1 or 2 toys for the cat and make sure it is enough spacious for the cat to move around. The carrier should be well ventilated and you must focus on it before buying. Before starting the long-distance trip, take your cat to the vet for a check-up and for making sure if all the vaccinations are timely given. You should take a health certificate from the vet because some airlines require the health certificate and sometimes they are also required for by road journey. Throughout the entire journey, if you want to keep your cat in a normal state, you should maintain a normal and relatively same routine before the move. Because animals are bound by their habits and sudden change in their regular routine can make problems for them. So, you have to stick the previous routine that has been established as before like feeding times, playtimes, sleeping time, medicine time etc. In this way, it will be easier for you to move your cat. You must make a list for your cat’s essential items like foods, bowls, and cups for feeding and drinking, toys if anything is really dear to it, medications, flushable litter, plastic bags, bedding like blanket or pillow, pet stain remover etc. You should not take your cat with an empty stomach. You have to feed it 4 hours before traveling so that the food can digest easily. You should also try to make it pee or poop before the journey for safety. Try not to feed the cat during travel, it may cause stomach upset. It’s not actually necessary. But you can search for a new vet at the destination in any case of emergency. On the day of the trip, you should give your cat its own space. During the journey when your cat is kept inside the carrier it may look stressed. Do not worry this is really normal. You must resist yourself from making it free from the cage as it will make your problem more complex. A spooked cat can instantly run out of the pet carrier and it will be really difficult for you to take it back inside the carrier and make it calm. During the journey, the cat can be meowing all the time. This is absolutely normal and eventually, it will stop meowing and may fall asleep. But if it starts panting, this is a bad sign. Panting is not really that much normal for your cat. You should take necessary actions according to the situation of your cat. If anything goes serious, you may have to stop and go to the vet immediately. Panting is actually a sign of extreme stress. For this reason, you have to keep your cat stress free and comfortable. You can give it any favorite toy or anything to play for distractions. Maximum planes allow the pets inside the cabin. But there are limitations of number per flight. So, before taking the pet to the airplane, you should check that they will allow the cat or not and also should check the procedure for booking when traveling with a cat. Then you must discuss pet travel policies and do the paperwork with airlines. If possible, try to book a direct flight. In some country’s there are restrictions about the pet policies. Traveling with a cat might be considered as importing. In this case, you have to be pre-alert. You may have a carrier but that may not be airline approved. For this reason, before buying carrier you should focus if it can fulfill the conditions of the airlines or not. Soft-sided carriers are required in maximum cases. You should put your name and contact number in an envelope and attach that to the carrier. Before getting on the plane, feed your cat. If it’s a long journey, you can’t feed it properly on the plane. During flying, if you are allowed then make the cat drink water after some time has passed otherwise it can get dehydrated. Feliway is a pheromone product which can be used for calming down the cat. The spray has to be applied to the bedding or the towel inside the carrier and this will help to remove the stress and create a state of content and calm in the cat. However, do not use it without consulting with a vet. To lessen the cat’s stress you can take it for short trips like the bank of the nearest river or park or market. This will help the cat to cope up easily with the upcoming long distance journey. In the worst case, if your cat is not at all ready for the trip and this is making the cat more anxious then you can ask for a sedation. Obviously under the suggestion of a veterinarian. By giving a light sedation will really calm down your cat and make it more comfortable for you. This is all about how to transport a cat by car long distance. As a good owner, you should follow these tips during your travel and make the journey for your cat less stressful.